On D-Day no one landed on Red Beach. 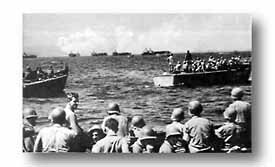 When special demolition boats went out of control and were unable to force a passage through the extensive mines and underwater obstacles that lined the bay, the Navy Commander responsible for getting the troops in decided against trying to land the 142nd there. 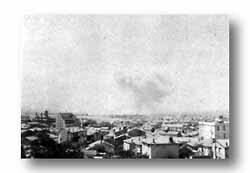 The original plan ordered an assault across the strip in the foreground to the near side of the hotel (upper left center). 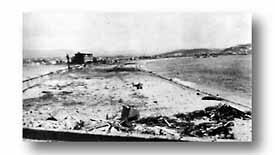 Early the second day the 143rd, attacking from San Raphael, captured the beach from the rear. After the anti-invasion defenses were cleared from the shallow water, a division of follow-up French troops immediately entered France across Red Beach. The first wave poised impatiently, ready to go in for the kill. Naval Commander decided against assault. From a hill before San Raphael, garish fishing port, shells could still be observed falling on Red Beach. Success at the beaches was complete. Men and supplies were pouring over them. 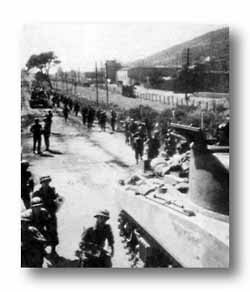 Now to avoid a repetition of fateful Anzio, troops pushed hard to exploit their initial victory with lightning speed, refusing the Germans a moment in which to regroup and strike back. San Raphael and Frejus were immediate objectives. After they were taken a phase of highly-mobilized warfare began. 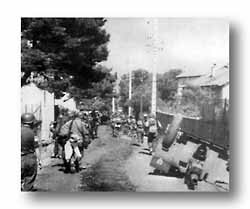 The 36th moved off the beaches and into the towns. Artillery piece was overturned by an anxious driver. Tanks and infantry pushed inland. Initial objectives were quickly seized as Germans were taken by surprise.